Never make assumptions, no matter how ‘safe’ they are in general. At a job interview? This counts double, whether you’re the interviewer or the candidate. Make sure you know the information on the application, which can prevent you from wasting everyone’s time in avoiding an interview with someone you would never give a chance in the first place. To be fair, David’s snarky moment wasn’t exactly called for, but he’s lost more than a few opportunities over his age. After a while, he’s done being ‘polite’ over those missing that he’s underage. 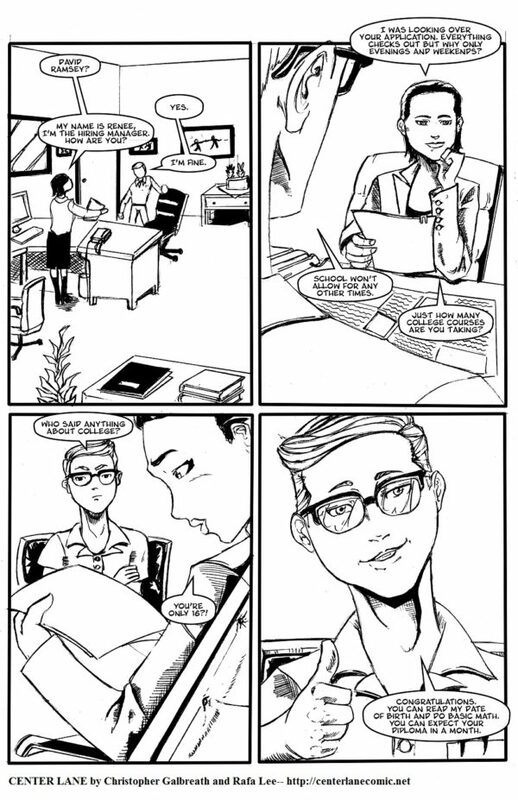 Welcome to Center Lane, a new online webcomic written by Christopher Galbreath (a.k.a. “Izumi Ryu“), and produced by Rafa Lee. Look forward to updates twice weekly. This page can also be a reference to a certain guest appearance in Between Failures. └ Tags: Job Interview, Why is Everyone Surprised About My Age? Now, let’s see how well that start turns out. To be fair, she did set herself up for that. He knew by her reaction he wasn’t getting the job anyway, so might as well “fail spectacularly”. In his defense, he ‘knew’ he lost the job once she reacted to his age. I’d say he should take a class in how not to get hired, but it seems he already has a handle on that. David is kind of a little jerk, isn’t he? Mainly with ‘stupid’, and especially when it’s his own stupidity.